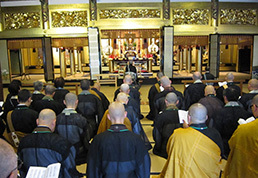 Bukkyo Dendo Kyokai believes that whoever preaches the teachings of the Buddha should enthusiastically live with the teachings themselves and provides opportunities for Buddhists priests and leaders to share the Dharma together. 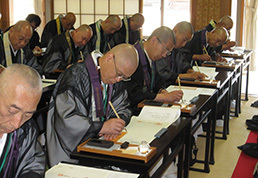 The Buddhist Missionary Seminar (BMS) study groups encourage participants to experience and practice the path of the founders of various Japanese Buddhist schools. BDK hopes participants will deepen their understanding of Buddha’s teachings by listening, thinking and sharing with everyone. 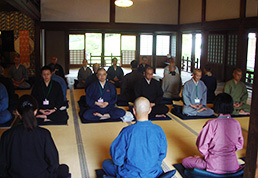 The BMS introduces various practical activities such as meditation, calligraphy and lectures by respected teachers. 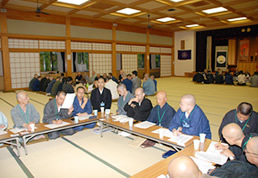 Discussions and interaction among participants are a highlight of the seminar. Participants are able to bring back what they learned at BMS, and incorporate these things into their own teachings and propagation efforts. BDK truly wishes that priests and nuns will take part in the seminar to discover something which will assist them in their missionary work.